Kazakhstan's two-time World Champion and Asian Games winner, 28-year-old Serik Sapiyev, made his anticipated debut in Baku and as expected did not disappoint as he put in a virtuoso performance to stop Ecuador's Independence Cup winner Carlos Sanchez in the last round of his fight at the AIBA Boxing World Championships. 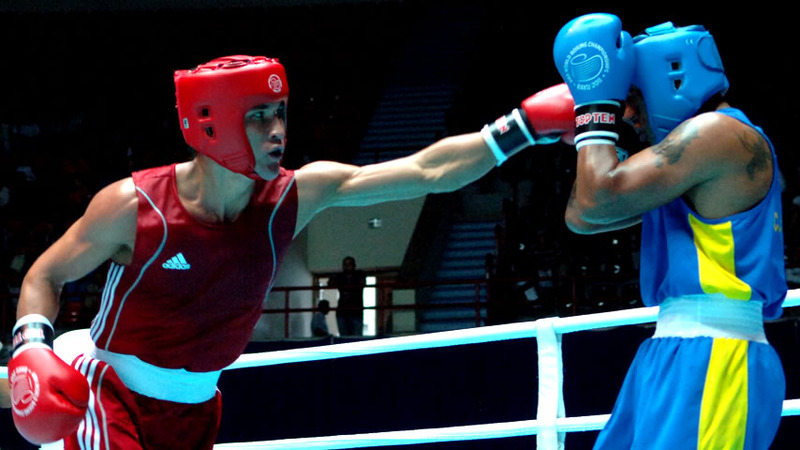 Proceedings on the fourth day of competition were opened by the welterweight battle between Mexico's 21-year-old AIBA Youth World Champion Oscar Molina and Venezuela's Panamerican Games Qualification Tournament silver medallist Gabriel Maestre. A close contest ensued but it was Maestre who made the decisive points to take the bout 15:12; up next for the Venezuelan will be the No.1 seed in the draw, Hungary's European Champion Balazs Bacskai. US National Olympic Trials and Four Nations Tournament winner Errol Spence competed in the last edition of the AIBA World Championships in Milan but his target this time is not only Olympic qualification but a podium finish as well. The 21-year-old American boxer got one step closer to his goal as he clinically dispatched Iranian National Champion Amin Ghasemipour in impressive style 28:10. Thailand's Southeast Asian Games winner, 24-year-old Apichet Saensit is competing in his third AIBA World Championships and he made his experience count as he defeated Bulgaria's Nayden Stoyanov 20:11 to set up a meeting with Kazakhstan's Serik Sapiyev. Germany's 20-year-old two-time National Champion Patrick Wojcicki fought a close contest with Cameroon's All Africa Games winner and Beijing Olympian Joseph Mulema, with young German prospect just edging it out 12:11. Strandja Memorial Tournament winner and Commonwealth Champion Fred Evans was the second Welshmen to secure a gold medal at the European Championships in Ankara in June. The 20-year-old fighter was completely dominant in his opening contest against New Zealand's newcomer Ricky Murphy and defeated him by 21:6. Ukraine's European Championships bronze medallist Taras Shelestyuk had a strong opponent in the first preliminary round in Baku but he overpowered Denmark's AIBA World Championships quarter-finalist Torben Keller and cruised to a 23:8 victory. Defending AIBA Youth World Champion and Asian Games winner Vikas Krishan Yadav is India's great hope with the 19-year-old boxer comfortably advancing to the next stage of the Welter Weight (69kg) category in Baku in his new 69kg weight class, the young pretender defeated Kyrgyzstan's AIBA World Championships quarter-finalist Asadullo Boimuradov 16:8. One of the best fights of the day was disputed by Uzbekistan's 20-year-old Asian Championships bronze medallist Nodirbek Kosimov and Romania's Athens Olympic Games bronze medallist Ionut Gheorghe who returned to boxing last year after time away from the ring. The Romanian welterweight competitor turned back a first round deficit to win 23:17 and become the first boxer to eliminate an Uzbek fighter in Baku. Lithuania's University World Champion veteran Vitalijus Subacius, having moved up to super heavyweight follwing his loss to compatriot Evgenijus Tutkus in the 91kg category, made his debut in Baku and defeated India's Commonwealth Games winner Paramjeet Samota 14:12. Subacius will now face Belarus' Olympic Games silver medallist Viktor Zuyev for a Top16, and not the very first time in his career. Georgia's European Championships bronze medallist Mikhail Bakhtidze competed in his first international event only this year while his opponent AIBA World Championships quarter-finalist Primislav Dimovski from the F.Y.R. of Macedonia is a veteran, having been involved with his the national team since 1998, however here experience counted for nothing as Bakhtidze won the bout 15:10. England's European Championships quarter-finalist Anthony Joshua only joined his national programme this year but demonstrated his tremendous power in Baku where he stopped Trinidad and Tobago's 21-year-old Commonwealth Games silver medallist Tariq Abdul-Haqq in the last round of his bout; the ringside doctor cutting proceedings short due to the Caribbean boxer's injury.